Trois Rivières VSOP Special Reserve has aged in French oak casks for more than 5 years. 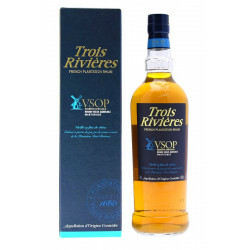 Trois Rivières VSOP Special Reserve is a unique rum of the Trois Rivières range, of standout smoothness and delicate richness. Fruit of a harmonious blend, Trois Rivières VSOP Special Reserve has aged in French oak casks for more than 5 years, in the house cellars. It offers a rich palette of flavours, with notes of blond tobacco, gingerbread and dried fruits. Colour: intense gold with delicate copper hues. Nose: complex fragrances. Rare scents of fresh fruits, bond tobacco and gingerbread. Palate: smooth and rich. Reveals a perfect cocktail of flavours, with dried fruits, honeyed tastes and spicy notes. Finish: strong, long and aromatic.